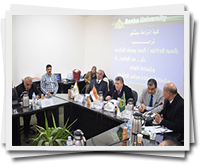 El-Kady sings a memorandum of understanding between Benha University and Surrey University in UK. Iftar party on the occasion of the accreditation of the faculty of agriculture by the national authority of quality assurance and accreditation of education. Benha university’s students win 14 awards in “Ibdaa” cultural contest in Sharja.